Because the "regular" 650-hp RS7 apparently isn't good enough. Being a part of the Volkswagen Group has countless perks. From platform sharing to engine, there’s a vast parts bin for its brands to work from, and now we’re hearing that Audi has managed to unlock the doors to Porsche’s engine warehouse. Evo claims that, in addition to the upcoming redesigned Audi RS7’s 4.0-liter twin-turbo V8 with 650 hp, there’ll be an even more powerful RS7 as well. Right, as if 650 ponies isn’t good enough. For some, well, it’s not. This hybrid RS7 will come powered by the Porsche Panamera Turbo S E-hybrid’s electric motor technology. This will be Audi’s first plug-in hybrid performance road car, and its engine technology has already proven itself in the Panamera Turbo S E-hybrid. The new 4.0-liter twin-turbo V8, also shared with the new Bentley Continental GT and Porsche Panamera Turbo, alone produces around 650 hp and 600 lb-ft of torque. It’ll be paired with, once again, the new eight-speed S-tronic gearbox, sending power to all four wheels. As for the RS7 plug-in hybrid, that extra 150 hp comes from – you guessed it – the electric motor, which is powered by a lithium-ion battery pack. 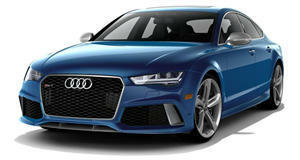 Interestingly, sources claim the RS7 hybrid’s V8’s output will be dialed down to 550 hp, for a grand total of 700 hp. Why not go all out with 800 hp? More than likely it’s simply just too much power for the car (and driver) to handle. Remember, the new Ferrari 812 Superfast hits the 800 hp mark, so it makes sense for Audi to bring things down somewhat. But really, 700 hp is pretty nuts already. And remember, this isn’t just a rumor; Evo has confirmed this with Audi’s design chief, Marc Lichte. The new RS7 Sportback, with both engine setups, is due to go on sale in late 2018.